The term Pharmaceutical Industry comprises everything from research, development and manufacturing to commercialization of products mostly produced in batch processes. 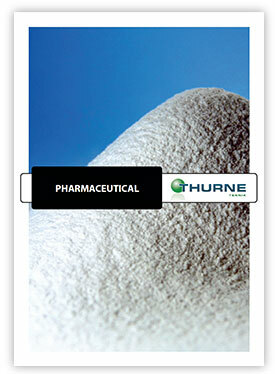 Products within the pharma process are often found in life science, (oral) solid dosage, API and functional food. Typically for the API production is a synthesis process, containing raw material storage, dispensing and charging into reactors, followed by dryings steps using filter dryers, centrifuges or vacuum dryers. The product is then conveyed, micronized, dispensed and packed off. These steps normally require to be contained depending on the nature of the API, using isolators, powder transport systems and adapted valves. The formulation process is generally divided in wet and dry granulation, regardless the API’s need to be dispensed and mixed/ blended with additives in order to get a final product. Healthcare reforms, patent expiries and increased service requirements urge pharmaceutical companies to adapt their business model. Living up to a complex regulatory legal framework is as challenging as increased competiveness, more potent API’s (higher containment requirements), multipurpose processes, lean production philosophy and decreasing maintenance costs. Together with well-established partners, Thurne Teknik offers high quality process equipment such as material handling solutions, equipment for dispensing and complete process lines including contained discharge, filling, conveying, dosing, mixing, dispensing, sampling, micronizing, milling, sieving, granulation and pack off equipment. All equipment is designed for high containment applications and follow the cGMP standards.